Shred staples, CD's DVD's and plastic credit cards with this small office paper shredder! Cross cut paper shredding with multimedia funcionality! Features The 50414 paper shredder has the ability to get the job done quickly and easily. 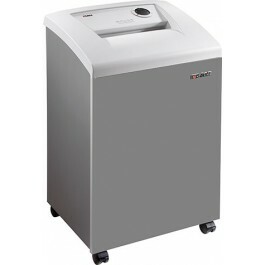 Small offices or teams of employees will benefit from the ease of use and quiet operation of this mid-size shredder. It's perfect for destroying personnel records, client proposals and tax information. 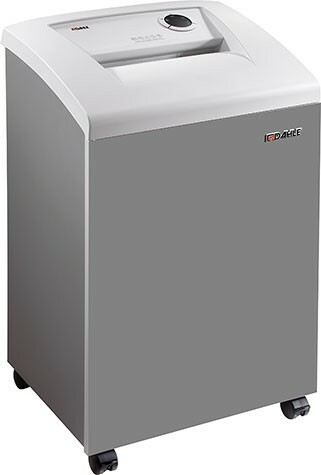 Shred Size 3/16" x 1-1/4"
Dimensions (h x w x d) 17 1/4" x 21 1/2" x 36 3/4"
The 50414 Deskside Paper Shredder is a Security Level P-4 shredder. The 50414 paper shredder has the ability to get the job done quickly and easily. Small offices or teams of employees will benefit from the ease of use and quiet operation of this small to mid-size shredder. It's perfect for destroying personnel records, client proposals and tax information.